Contact us for more information about our IT solutions for commercial organizations or federal agencies. For nearly 20 years, we have been providing IT solutions and security to the federal government. Tanager applies its qualified professionals, disciplined process and innovative solutions to help clients minimize risk and maximize productivity. Our key to success in the government space is employee retention. Most of our employees have been with us for over five years. Our people are dedicated and skilled in some of the more obscure systems that require support. When it comes to IT solutions, Tanager brings infrastructure knowledge and experience in mitigating threats to that infrastructure. Our portfolio of Cyber Security Services includes the use of traditional cyber defense solutions and services that apply a defense-in-depth approach, as well as the knowledge to address cyber security risks which stem from the adoption of new technologies and changes in architecture. 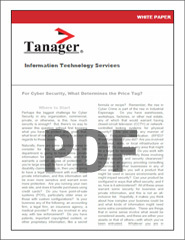 Read how Tanager provided security hardened COTS laptops to the US DoD. Read about the vulnerabilities in Adobe’s Flash and what to do about them. Download our Capabilities Sheet [PDF, 684KB]. Tanager is a leader in providing innovative solutions in areas of Information Technology, Cyber Security, and Insider Threat Mitigation. Search our database of open positions or submit your application for consideration. We want to hear from you.